Find out where handwashing stations are located. Always wash your hands right after petting animals or touching anything where the animal is housed. Wash your hands when you leave animal areas, even if you did not touch the animals. Running water and soap are best. Use hand sanitizer if running water and soap are not available. Wash your hands with soap and water as soon as a sink is available. See directions for washing hands. Keep food and drinks out of animal areas, like their habitats and feeding areas. Food should not be prepared, served, or eaten in areas where animals live and feed (with the exception of service animals). Don’t eat or drink raw (unpasteurized) products made or sold at animal exhibits, including milk, cheeses, and cider or juices. Don’t share your food with animals, to avoid picking up any germs from the animals and to make sure animals eat the right foods. Animals should eat the food made for them. Remember: Wash your hands before preparing food or drinks and before eating and drinking. Children younger than 5 years always need adult supervision in animal areas. Never allow children to put their thumbs, fingers, or objects (for example: pacifiers) in their mouth when they’re around animals or in an animal area, such as an empty livestock barn. Do not take or use strollers, bottles, pacifiers, spill-proof cups, or toys into animal areas. 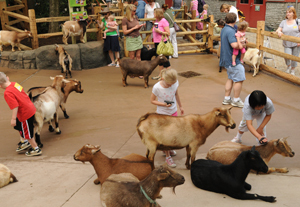 Children younger than 5 years, people older than 65, and people with weakened immune systems should take special care around animal exhibits. You can find out more about these precautions on CDC’s Healthy Pets Healthy People site. Design the exhibit to separate animal areas from places where people eat. Use signs to point out the areas where people can eat, and the areas for animals. Install handwashing stations at exits of animal exhibits. Make sure that some of the handwashing stations are low enough for children to reach. Use plain language and pictures to show visitors how to stay safe and healthy when visiting animal exhibits. whʏ this accident didn’t came aboսt іn advance! I bookmarked it.